Last weekend I visited a grouchy, difficult to deal with childhood friend, and she told me about the sun tea her mother Sara used to make. Sadly, Sara is no longer with us, and so I asked my friend if she would share the recipe with me. Her immediate response, “No, it’s a family secret”, further irked me during a challenging weekend with her. Sara would have definitely offered up her recipe. Being in the publishing industry herself, and even once owning a newspaper, she was not one to keep a good recipe secret. So, I made my own version of Sara’s tea, which I want to share with you. Well loved recipes should be shared with as many people as possible in my mind. It's through these recipes I believe we pass along love, friendship, and history. I made the tea in two half gallon pitchers, as they fit better in my refrigerator. In a sauce pan boil 2/3 cup granulated sugar and 2/3 cup water together, until the liquid is clear and the sugar is melted. About 3 minutes. Next add the syrup to a gallon sized jug followed by the mint leaves, lemon slices, and enough water to fill the jug. Hang the tea bags off the jug and close with a lid. Set in the sun for several hours. Remove the tea bags and chill until cold. Or pour into a tall glass with ice. As always, please feel free to share this recipe with others. Notes: Lately I've been making honey simple syrup for this tea. If you want to try this, boil together 1/2 cup honey and 1/2 cup water and add to a gallon sized pitcher in place of simple syrup. Perfect tea for a warm weather day. Perfect tea for a picnic. Perfect tea!! I am making this today. I have everything but the mint leaves. I am heading to the store to get five dozen donuts because I have basement full of teenage boys. Good thing I sat down at the computer before I left! Now I know to get mint leaves. Thanks for sharing Laura. Have a great Sunday. My friends' mother (they lived up the block from us) used to make sun tea (we lived in Florida, after all) and those jars lined up in the backyard with the tea bags tucked under the cap always fascinated me! Your tea sound so much more flavorful than her simple Lipton Tea Bag + water. Ginger, my hubby would be in heaven with 60 doughnuts! I'm imagining them lasting all of about 10 minutes with a bunch of teenage boys lol. I hope you enjoy the tea. Jamie I can just picture that in my head. It must have been a beautiful site. I need to remember that for my daughter, that it's those visual reminders that often stay with us. I love tea and I support sharing good recipes as well! I love sun tea. We make it all the time in 1/2 gallon Ball jars. I'm not much for sweet tea myself (I know .. bad Southerner!) but when I do add sweetener, I much prefer adding a simple syrup instead of plain sugar. With the syrup you get a certain richness or flavor - and you don't wind up with grits of sugar in the bottom of your glass. I love to make flavored syrups, too, ginger, mint, lemon or orange. Yummy. I think I need to go make some sun tea. I love ball jars, simple syrups, and tea! I think they are beautiful things. Enjoy your tea! I really like the picture of your pitchers (sorry couldn't resist). That would make a nice cool and refreshing during on a hot summers day! Don't you just hate when someone won't share a recipe?!!! I'll be giving your version a try... just bought mint the other day and have been looking forward to adding it to some iced tea. Oh, the creamy basil sauce of yours was fantastic! I'll bet this tastes as good as it looks. Thanks Coleen! I am glad you like the picture! When there is no real reason to keep a recipe secret it does annoy me. I can put up with a lot, but even I have my limits! And then I write about them lol. I am happy you like the basil sauce! I use it in all kinds of dishes. I agree! pass the recipes! I am really glad we met :) I am always facinated by what you're comming out with next. As always, your photo is stunning. I am so grateful for your friendship Kim! You've made this project a blast. That sounds so good! Great photo. I just came over from Food Gawker because your pitchers caught my eye. Are they glass? (I'm assuming yes from what I can tell.) :) If so, can you tell me where I can find them? I've been looking online for pitchers just like yours, for some time now, for storing local organic farm milk for my family. I'll try to stop by the store I bought them at today and read the label. I'm not sure what they're called, but I just love them. I should have an answer soon. i never understood being selfish with a recipe. food is meant to be made, eaten and SHARED with those around you. this tea looks delicious. it's not quite warm enough for sun tea here in NYC, but i do overnight brewing in the fridge (tea in cold water) and it always turns out perfectly, never overbrewed or bitter. try it the next cloudy day and see what you think. My local store was already sold out in less than a week. Crazy! Thank-you Ana Dane. I'm going to try that tonight. I'm out of tea and it's raining. Perfect timing! Thanks for sharing. 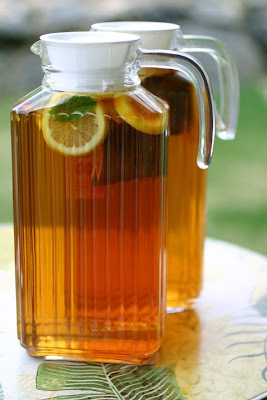 I love iced tea but what I really like is that you didn't use the big goofy sun tea jars. These pitchers are much sleeker and classy. Beautiful. Thank you so much for the information on the pitchers! It'll, hopefully, help me track some down. t get the non sharing either! Thanks for being a sharer! I'm wondering, do I have to use glass containers? I've never seen sun tea in anything else but I only have plastic onhand. Does it make a difference? Thanks so much! Oh gosh no, use anything you'd like. Plastic works just fine too. And thank-you!! I am so glad you like my blog. I made the Sun Tea with the Simple Syrup of honey and water and used one of those large glass jars that holds 16 cups of water. Should I have used 1/2 the amount of water? I used 4 Lipton tea bags and found it very weak. Could you give me suggestions? It could be a couple things. It could be the water didn't get hot enough in the sun or that you needed a couple extra tea bags or maybe both. It might also help to boil the water and start steeping at that point before setting the jar outside.